Beyonce has hit her last note and John Legend and Common are done belting out “Glory” from “Selma” — that means the 2015 Grammys are officially over. And no offense to Pharrell Williams or Beck — two big winners on Sunday — but the night clearly belonged to Sam Smith. After taking Best New Artist, Smith also won Record of the Year, Song of the Year and Best Pop Vocal album. Smith also provided a top-notch performance with Mary J. Blige, and may have had the best acceptance speech of the night as well for his first of four. Beck took home Album of the Year. The 57th Annual Grammy Awards — which aired on CBS and were once-again hosted by LL Cool J — ran more than three and a half hours, packing 23 performances. 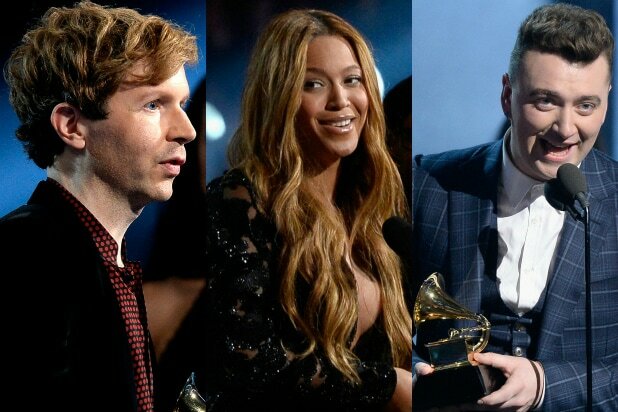 Readers can check out the full list of winners at Grammy.com. As Grammy weekend hits full stride, parties are in full swing. TheWrap's Party Report is inside and backstage the best bashes. The MusiCares Person of the Year tribute to Bob Dylan was the most prestigious event on Friday night. Bruce Springsteen, Don Was, and Tom Morello formed a super group as a parade of stars performed Dylan covers. Former President Jimmy Carter presented Dylan with his award, with NARAS President Neil Portnow. Dylan went on to speak for 40 minutes. Bruce also covered "Knockin on Heaven's Door." Alanis Morissette (with Mario Treadway) performed "Subterranean Homesick Blues" at MusiCares. These two have been inseparable all weekend. Kat Dennings and Josh Groban arrive at the Convention Center. Stills, Nash, and Crosby (in that order) gave a rendition of "Girl From The North a Country," a song Dylan once doubled up on with Johnny Cash. Meanwhile in Fryman Canyon, Questlove (or "Amir" as all his friends call him) hosted his revolving Food Salon at the fantastic party home of CAA agent Brian Loucks. Adrian Grenier and Zoe Kravitz were amongst those milling around the living room. Michelle Branch and Ludo Lefebvre personify the interesting mix of notables from music, food, fashion, and even fitness: high profile "Hollywood Trainer" Jeanette Jenkins was in the mix, as was E! 's Alicia Quarles. The ampersand ("&") on Amir's jacket could stand for "and Dell", who partnered on the evening with technology from the front door check in to menus inside. Dell's Neil Hand with the Roots bandleader. Host Brian Loucks, DJ Alex Merrell and Grenier at the Food Salon, which was a sanctuary from the noise of Grammys weekend and kickstarter to Friday night. At The Sayers Club, T.I. had the super happy music man who produced his Paperwork album last year and put him on "Blurred Lines" join him for a the Austin City Limits-sized music circle at the SBE venue. Sony and Avion Tequila partnered up for the Friday night show. West down Sunset back in West Hollywood, Lil Kim performed at Galore Mag's party at 1Oak. Nas was in the crowd to find out "How Many Licks" it takes. Across the street at State Social House the next morning, Nick Cannon attended a brunch for Mona Scott-Young, Missy Elliott's manager and the producer behind "Love & Hip Hop," posing with the mimosa fuel - XXIV Karat Champagne. There were no reservations to be had at Craig's on Friday night, unless L.A. Reid booked you himself. The Epic Records Chairman hosted a dinner with Janelle Monae (center), Meghan "It's All About That Bass" Trainor (right), Ciara, the Braxtons, Luc Belaire served on the table, and Babyface mingling amongst the crowd. Snapchat CEO Evan Spiegel was in the mix, but he did not take this photo. Straight out of NOLA, the Preservation Hall Jazz Band played Nielsen's Grammy-eve party at Hyde Kitchen on Sunset. Earlier on Friday, Pharrell Williams and Ed Sheeran rehearsed at the Staples Center. From the Grammys to head-scratching Coachella headliners: AC/DC's Brian Johnson and Angus Young . The freak/fluke Norwegian R&B singer Bern/hoft (who netted the first ever R&B Grammy nomination by a non-American) performed downtown at the Continental Club for a Keurig party after the awards on Sunday night. 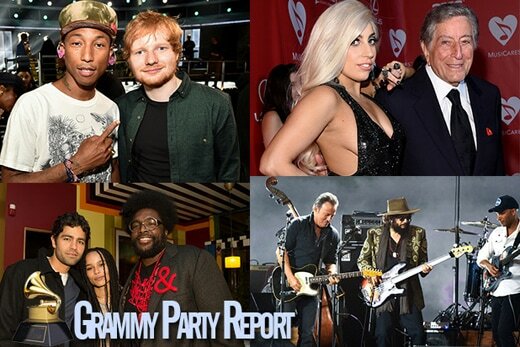 Grammy parties are in full swing from West Hollywood to downtown and TheWrap is inside and backstage the best bashes. Lincoln multicultural marketing manager Shawn Thompson, Essence President Michelle Ebanks, Chaka Kahn and Essence Editor-In-Chief Vanessa K. De Luca at Essence's Thursday night party at Avalon. The turnout at Delta's pre-Grammy party at Soho House typifies the diverse range of musicians mingling: Jordin Sparks, Miguel (who walked a carpet here two years ago virtually anonymously), Maroon 5er James Valentine, "Gone Girl" mistress Emily Ratajkowski, and EDM sensation Zedd. ..and spent time with the bosses: Grammys producer Ken Ehrlich and NARAS president Neil Portnow. One who was not on stage last year, Andrew Hozier-Byrne, with Annie Lennox at rehearsals. A few blocks away from the Staples Center rehearsals, Emma Roberts lit up the carpet at Rolling Stone and Google Play's concert party at the El Rey on Thursday night. Google Play VP of Marketing Brian Irving and Rolling Stone Publisher Michael Provus, who has put on 3 events in the last two weeks at Sundance and Super Bowl. Meanwhile over at the Wilshire Ebell on Thursday night. Aloe Blacc and Melissa Etheridge shared the stage. Also at the Ebell, Willie Nelson puts one up for the charity focused GRAMMY Foundation's 17th annual Legacy Concert dubbed "Lean on Me." While Charli XCX performed at Delta's party at Soho on Thursday night, one artist she helped break on social media was on stage a few blocks down at the House of Blues. Ryn Weaver took part in MTV's Artists to Watch showcase. Tons of people, and fans, are already watching Hoodie Allen. The "All About It" singer on stage, Hoodie Allen. Samantha Ronson avoids the "Who is that?" problem -- as if she has not been followed by TMZ for 8 years -- at Google Play and Rolling Stone on Thursday. The night before, Eva Longoria hosted Svedka's "Stupid Cupid" Valentine's Party at West Hollywood dive Barney's Beanery, where she was a regular single gal: Shooting pool, playing air hockey, and posing with social media star "Fat Jew" (he has a show coming to Comedy Central soon). Before the festivities hit high gear, Flea and Portnow supported a Grammy event honoring Nile Rodgers at the Village Studios on Tuesday.